Memory lap 60 , it Is possible to store the pause time, revolutions and the partial with the date and view them later. A data record consists of: date, pause time, lap time and split times. The memory can store up to 60 records. Pedometer (distance) A sequence of tones set to a measure helps to maintain the rhythm of the steps. If you entered a stride length is calculated, the route and approximate location. Timer - 1/1 min. - 100 hours (with automatic repeat. automatic) For anyone who loves precision: countdown timers help you remember special events or that are repeated, emitting an acoustic signal at a preset time - then resume to count automatically from the set time. The time can be set in minutes and with an advance of up to 100 hours. Particularly practical for daily intake of medicines or interval training. Glass clock convex surface of the watch is convex. It has a great stability and resistance to pressure. 10 years - 1 battery 10 years 1 battery. Thanks to electronic components that are recently developed, the power consumption is considerably lower. 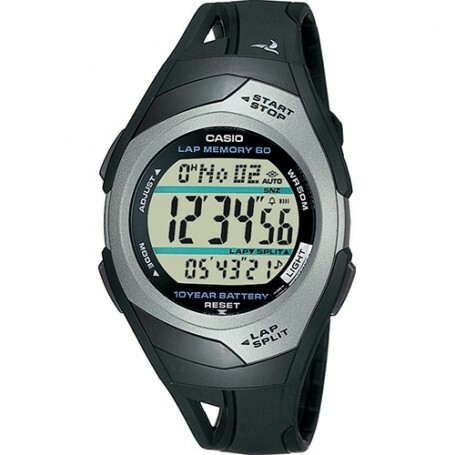 Water resistance classification (5 bar) You can get the shower and bathroom with this watch on your wrist: is approved for a watertightness up to 5 bar (ISO 22810).